Freelancing is liberating in many ways, especially when it comes to escaping the office. Excessive meetings, long commutes, and the dreaded open office floor plan are a few unpleasant aspects of 9-to-5 life to which freelancers can wave farewell. Ditching your work clothes for sweatpants only sweetens the deal. There are downsides, though, to not having a workspace provided for you. You might get lonely, or distracted, or just uncomfortable making due in your apartment or the nearest free wi-fi hotspot. So what are the best options for staying focused and organized on your own? A dedicated home office, local coffee shops, and coworking spaces are popular choices. Tired of working from the couch or kitchen table? Creating a dedicated workspace is one option. This assumes you have the space to do it, of course, but it’s possible to create a separate office space with only a desk and chair—even without a spare room. This is likely the most affordable option. Without a commute, you can save on transportation costs. You may spend less on eating out. 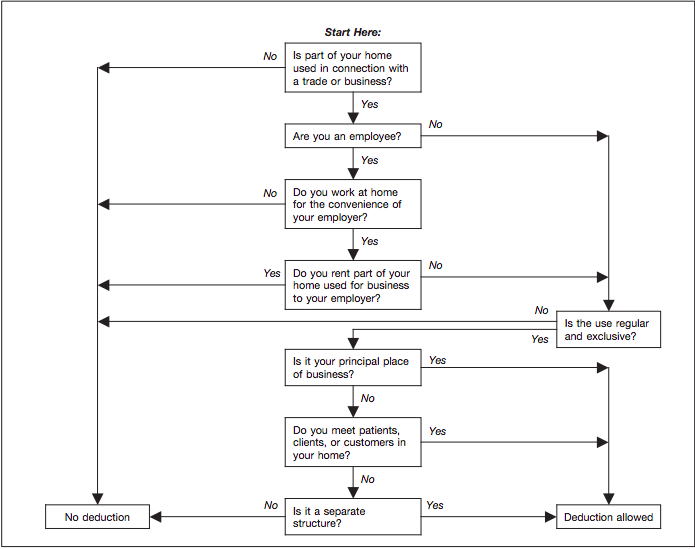 It can be difficult to qualify for the home office deduction. Your home, family, or pets may be distracting. The lack of in-person human interaction may make you lonely. Regular and exclusive use means your designated office space is exclusively for business. That means you can’t use the space for anything personal. For example, your home office can’t double as a guest bedroom. Principal place of your business means you do most of your work there. The IRS looks at the type of work and how much time you spend there. If there isn’t another office where you do most of your work, you may qualify. “A lot of people think working from their bed or kitchen table qualifies for the deduction,” says Eric J. Nisall, a Florida-based accountant who specializes in working with freelancers. The rules don’t work like that, and Nisall strongly urges against trying this. Even if you do meet the requirements, the calculation can be tricky. There are two different methods for deducting, one with a standard $5 per square foot deduction, and the other calculating your home office's actual expenses. If you're unsure of which suits you best, it may be time to work with a qualified tax professional. If you are itching to leave the house, try working from a coffee shop or wi-fi enabled public library or community center. A change of scenery may get your creative juices flowing, and working with others nearby can help you feel less lonely. An added bonus could include meeting local freelancers. Coffee shops may be cheaper than a monthly coworking membership. Leaving the house can spark productivity. You can’t deduct your food or drinks as business expenses. There is no way to control the environment. Internet and access to electric outlets may not always be available. Working from a coffee shop every day can be more expensive than you would expect. A small cup of coffee won’t last all day, and you may feel pressure to buy more stuff to avoid glares from the baristas. If you think you can save your receipts and deduct them as business expenses—the coffee shop is like your office, right?—we are sorry to break the bad news, but this isn’t going to fly. “Food and drinks are only deductible for two things—travel and entertaining,” Nisall warns. Aside from the odd client meeting over coffee, working alone from a coffee shop doesn’t count for either of these scenarios. Coworking spaces have exploded worldwide over the past few years. And Emergent Research predicts 16.1 percent annual growth over the next five years, translating to some 30,000 global coworking spaces, and a lot of options. Having escaped the corporate cubicle, why on earth would you pay to rejoin office life? “Some people don't have the discipline to be in the comforts of home and still get work done,” says Nisall. Some coworking spaces offer a free trial. For example, WeWork’s day pass allows you to try their space for a day. You can meet other members, sample their free coffee, and get a feel for what it's like to work there. Access to desks, offices, and possibly conference rooms. Reliable internet and other utilities. Some places offer perks like free coffee, beer, 24/7 access, printers, and office supplies. Unless you buy a house specifically for the home office, or frequent a pricey coffee shop, this is the most expensive options. In Nashville, for example, prices range from $99 a month for 10 hours of access to a floating desk during normal business hours to $1000 a month for a closed door office with 24/7 access. Other members may be distracting. Coworking spaces have a lot to offer. But those amenities aren’t cheap. The good news is your monthly membership fee is a deductible business expense. It's like renting an office space, according to the IRS. Remember to save invoices and receipts to avoid headaches at tax time. It’s hard to measure the value of things like community and collaboration, or the stress of a large monthly expense keeping you awake at night. When it comes to evaluating something as important as where you conduct most of your business, look past the cost and into what’s going to be the most comfortable and productive choice.